Get ready for some style Down Under. Australian Fashion Week was under way and designer Josh Goot was no wallflower. Short dresses and short skirts with an occasional slim pant were demonstrated the color block trend in the extreme. 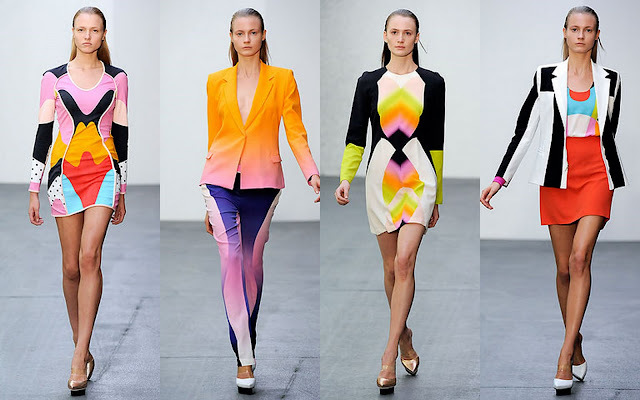 The graphic printed shapes were designed to flatter the female form. Black and white optical prints achieved a similar bold effect. The designer got his start studying media and production, but soon realized he would rather channel his talents into fashion. He got his big break winning Tiffany & Co.'s Young Designer of the Year in Australia. He has since garnered International attention and landed the cover of Womens Wear Daily. If you're looking for an outfit bold enough to keep the wallabies away, Josh Goot is your man.